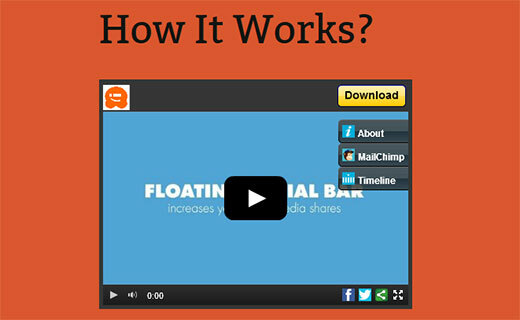 On our sister site list25, we learned how to build insane user loyalty by using videos. Videos can be used very effectively to increase traffic. The million dollar question is that once you have gained the audience, how do you convert those viewers into subscribers and customers? In this article, we will show you how to add highly engaging videos in WordPress using Viewbix and convert the viewers into customers. 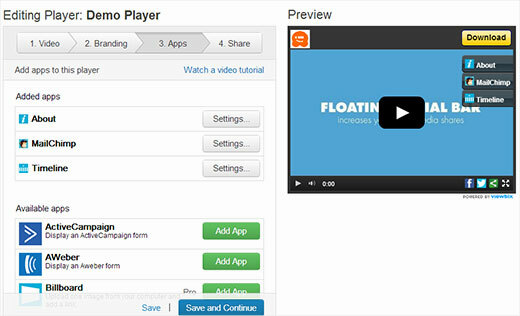 Viewbix allows you to create a highly customized video player. This video can be hosted any where such as YouTube, Vimeo, Amazon Web Services, etc. Viewbix allows you to add interactive apps to your video, so they can be prompted to take action while watching the videos. These actions can be share videos on social media, subscribe to your email newsletter, or a call-to-action to your product purchase page. Once you have signed up for Viewbix, log in to your dashboard and click on New Player button. 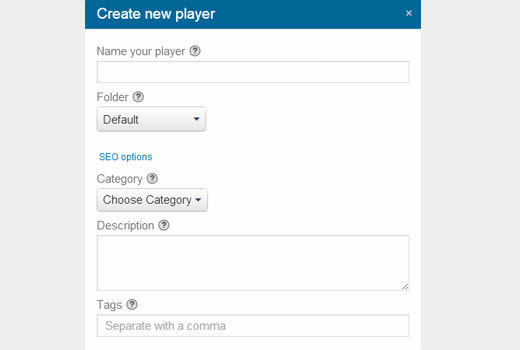 Give your player a title, choose a folder, and then click on SEO Options. You can choose a category for your video from the list of categories, provide description, and add tags to describe your video content. On the next screen you need to add your video. This video can be added YouTube, Vimeo, Amazon Web Services, or from your own site. If you are adding a video URL from your own site make sure that you have uploaded the video on your site in mp4 or flv format. We do not recommend adding FLV video because it will not be compatible on iOS devices. After adding your video’s URL, click save and continue. 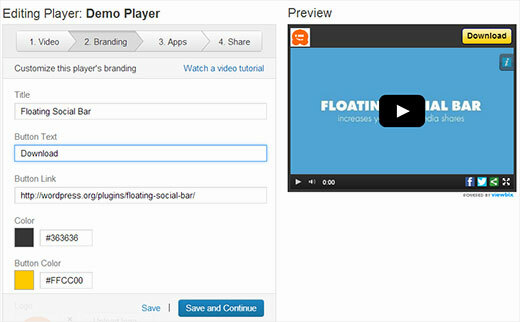 The next tab will allow you to add your own branding to the video player. You can add your logo, add a call to action button. You can also add social sharing icons and choose a color scheme for the player. Once you are done setting it all up, click on the Save and continue button. On the next tab you can add apps to your video player. There are a number of popular web apps available at your disposal. Click on an app that you want to add in your video, and then click on settings button to configure the app. Once you have added the desired applications, click on save and continue. On the next screen you will see the embed code to add this player on your site. But before you do that, you need to publish your video player to make it live. Click on publish button and once it is live, then you can copy and paste the embed code in your WordPress post or a custom landing page. That’s all. Now you have your customized video player that drives viewers to take action. You can further customize your video player as needed, add new apps and hook your video player to your mailing list, social media, sales page, etc. Viewbix also provides analytics, so you can see how users are interacting with videos and which apps or buttons are getting the most clicks. You can further boost conversion rates by running A/B split tests on your landing page. 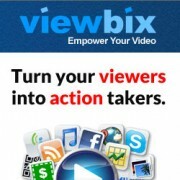 Viewbix is a robust platform that allows you to turn your video viewers into action takers. If your website is video focused or has a lot of video content, then you should consider giving it a try. The best part about Viewbix is that you can still upload your videos on Youtube and leverage the power of the second largest search engine while having a customized video player on your own site. All the views you get for the videos on your site are still counted as Youtube video views. We’d like to think of Viewbix as a great complimentary product to OptinMonster in getting more email subscribers. OptinMonster converts website visitors into subscribers, and Viewbix allows you to convert video viewers into subscribers and customers. Have you tried another custom video player like this? 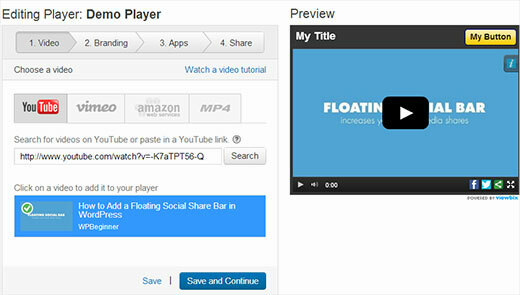 What are your thoughts on adding and engaging video player on your site? Let us know by leaving a comment below. This is a real nifty idea. I’ve always had trouble with getting a good email list. I’m going to give it a try. Thanks! Great tutorial. I’m looking forward to implement this on my site (or a client’s). Keep it up!